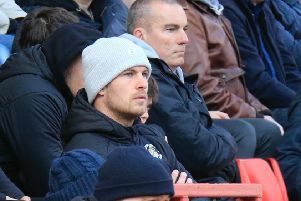 Newport County boss Mike Flynn felt his side had deserved to win their 1-1 draw against Luton at Rodney Parade. The Exiles got off to the perfect start, Josh Sheehan sweeping home inside three minutes only to be pegged back by Dan Potts’ seventh goal of the season. They are the top boys in this league, got the biggest budget, and my boys have been outstanding against them today. Newport’s goal led a charmed life at times in the first half, Potts having an effort cleared off the line before levelling, while James Collins was denied by a great save from Joe Day and hitting the bar too. After the break, there was little in terms of goalmouth chances at either end, Frank Nouble forcing a smart stop from Marek Stech and Harry Cornick off target for the Hatters. The hosts did have a goal chalked off, with the whistle going long before Sheehan found the net, with Stech not even attempting to make a save, as, Flynn said: “I thought we were the better team, especially second-half we were the better team and we should have won the football match. “It was a very good start, lively opener, disappointed with the goal we conceded because the boy has had a free header. “And then apart from James Collins hitting the crossbar, there wasn’t really that much more that they created. “They are the top boys in this league, got the biggest budget, and my boys have been outstanding against them today. “I thought we played some brilliant football today. Especially the goal that was disallowed because the timing of the run would have made it an unbelievable goal. “But you know, we’ve played a solid Luton team, a good Luton team and we were the better side. So I think we’ve done ourselves very well today.